WASHINGTON, D.C. -- There are many contemporary references to "evangelicals" in the context of the current American political scene. This is not new. I co-authored (with Stuart Rothenberg) a book aptly called The Evangelical Voter during the Reagan presidency more than 30 years ago, focusing on this group of voters and their impact on politics. There was then and is now no universally agreed-on definition of exactly who or what an evangelical is in American society. Within Christianity, still by far the dominant U.S. religion, all adherents are to some degree supposed to be evangelical in their life outlook -- spreading the gospel to other people. But in contemporary use, the term has come to be associated with a particular subset of Christians -- variously defined in terms of their religious affiliations (such as identifying with certain Christian denominations), their beliefs (for example, belief in an inerrant Bible), their practices (such as church attendance), their intensity (such as importance of religion), and through self-definition (for example, Do you identify as evangelical?). In recent decades, the term has been associated with a particular group of Christians who hold conservative and generally Republican ideological and political beliefs, as exemplified by recent news headlines such as these: "Poll: White Evangelical Support for Trump Is at an All-Time High," "Evangelicals Keep Faith in Trump to Advance Religious Agenda," and so forth. Here are five insights our research reveals about this often-cited but not necessarily clearly understood group of Americans. 1. 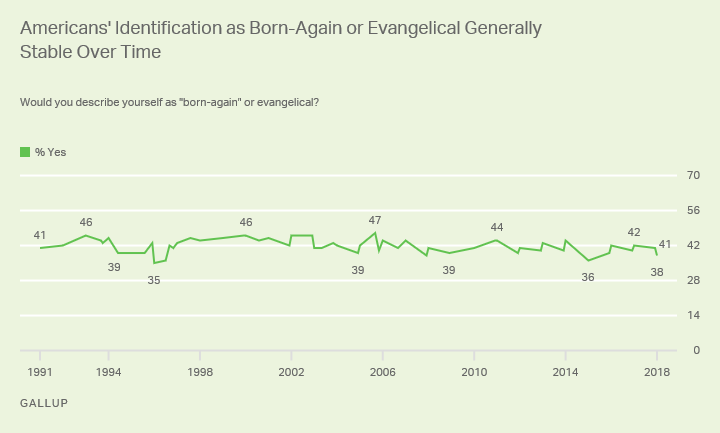 There has been little change in the percentage of Americans who identify as "born-again or evangelical" over the past 27 years. From time to time each year, we at Gallup include this self-definitional question in surveys: "Would you describe yourself as 'born-again' or evangelical?" This provides us with the great advantage of being able to track a consistent wording over time. The most interesting finding from our 27 years of tracking this question is the lack of meaningful variation. We have seen year-to-year fluctuations, to be sure, but nothing meaningful or sustained. The 42% of Americans who on average identified as born-again or evangelical in 1991-1995 is little different from the 41% over the past three years. 2. 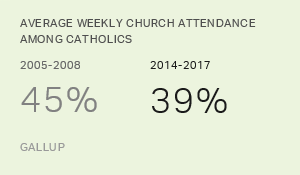 There have been shifts in other religious indicators over this same period, even as the born-again/evangelical population has remained generally constant. Since the early 1990s, Americans have become significantly more likely to say they have no formal religious identity and somewhat less likely to say religion is very important in their lives. Despite these trends, the born-again/evangelical percentage has stayed constant. 3. The born-again/evangelical population in this country is highest among blacks, who are overall the most religious racial and ethnic group in the U.S. Sixty-one percent of blacks in recent years have identified themselves as born-again or evangelical. By contrast, 38% of non-Hispanic whites and 44% of Hispanics say "yes" to this born-again/evangelical measure. 4. Non-Hispanic whites who identify as born-again or evangelical have been and continue to be more likely to have Republican inclinations. The black born-again/evangelical population is usually not the focus of political analysis, given that blacks are strongly likely to identify as Democrats and to approve of Democratic presidents and disapprove of Republican presidents -- regardless of their religiosity or evangelical status. But there is significant variation in political attitudes by evangelical status among whites. These relationships have been evident for years. The GOP identification gap between whites who identify as born-again or evangelical and those who don't is now 27 percentage points. There was a 20-point gap during the Barack Obama years, 2009-2016, and a 19-point gap in the last years of the George W. Bush administration, 2006-2008. There is a 25-point gap over the past two years in approval of President Donald Trump between whites who are born-again/evangelical and those who are not. This gap in approval was slightly smaller in 2006-2008 for Republican President Bush, but about the same, in the reverse direction, in terms of Obama approval between 2009 and 2016. Would you describe yourself as "born-again" or evangelical? 5. A significantly smaller percentage of Americans identify as "an evangelical" than identify as "born-again or evangelical." Gallup's latest survey included a variation on the long-term "born-again or evangelical" trend question, asking half of the sample, "Would you describe yourself as an evangelical?" This is the first time we have tested this wording, so there is no historical trend. 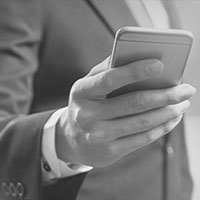 But the current results show that 21% say "yes" when asked if they describe themselves as "an evangelical," compared with 38% who say "yes" when asked if they describe themselves as "born-again or evangelical." Would you describe yourself as an evangelical? It is clear that the inclusion of the term "born-again" resonates with more Americans than just the word "evangelical" by itself, suggesting that the words "born-again" have more universal applicability than the term evangelical. These findings reinforce how important wording is when facing the basic challenge of determining who evangelicals are in U.S. society today. The data show that nonwhites particularly are more likely to identify with the "born-again/evangelical" than with the "an evangelical" wording. In addition to the presumed more widespread impact of the term "born-again," some nonwhites may view "an evangelical" as a political term associated with Republicans and therefore dissociate themselves from it. There is little substantive difference in Trump approval or Republican identification between those who identify as born-again or evangelical and those who identify as an evangelical.